Sunset Ridge is located in Springdale - just off the Wagon Wheel Exit. 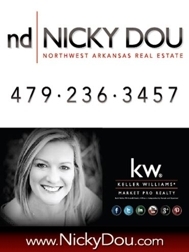 Sunset Ridge is a wonderful community with large lots and is convenient to all of Northwest Arkansas! Main Home is 3422 ht.sq.ft. Gorgeous hardwood floors, granite counters, whirlpool tub and much more! Enjoy The Video of this wonderful home located at 7003 Sunset Ridge Circle!